hello can anyone tell me why i cant seem to post my new slideshow to Facebook? ive been waiting although im new to roxio i have a free account although im going to switch to premium soon , i need to know why ive tried twice to sen my slideshow to Facebook and nothing happens, does it usually take a long time? and also why doesnt Roxio connect with YouTube and when are they going to? I haven't had the trial program for quiet awhile so I may be wrong. What happens when you try to post the page to facebook. Do you have that option? What do you mean by a long time minutes, hours or days? I assume that you have a facebook account to begin with. How long have you had it? Did you make any account changes? Have you tried setting up a new account for fcebook just for these PhotoShows just to see if there is a problem with your particular account? If you have the premium service, you have web space that you can personalize. It is as fast as YouTube but not as searchable. With the premium service and the desktop version of PhotoShow V6 , you can output the PhotoShow to a video file - mpg2 or wmv. You can upload that to whatever site you want to including YouTube. I use that all the time. hello digital guru for answering my post, but i have the free service for right now, and i dont know if i can post to facebook or not , it seems that it sets me up to do this but i dont really know, because its so hard to get good customer service with these people, and also what is photoshowv6 and does it cots a lot and does it come with the premium service? and also i thought with the with the free service for 30 days i can use the premium service also but it seems that i cant...anyway any light you can shed on my questions in this letter id gladly appreciate it. thanks so much. PhotoShow Version 6 is the full program that comes with the premium on-line service. There is no extra cost. You can download it to your desktop and use it with from your desktop, to make video files, upload the PhotoShows to the web or use the Roxio web service. You can also make PhotoSHows on the web and download the PhotoShows to your desktop. The mp4 downloads are iffy and work only about half the time. It is part of the premium package. Note that it is still usable after the first year. The trial you have is very limited in the number of images you can use, the type of music and the amount of video. The PhotoShows in the trial version also have a limited life on the web site. I have to ask because for a version or two, PhotoShow was included in the Creator Suite. Do you have it from there? i will be getting the premium subscription, so i hope to upload to youtube then! but as for facebook i do have a facebook account, but when i created my photoshow, it says i can post to facebook, it says "share my photoshow'' in grey letters so when i click on to this i waited a couple of minutes and nothign happened ! so i clicked on it again and i checked that even for a basic account i should be able to post to Facebook,) so i clicked on it again and i waited and nothing happened unless it takes maybe 15 minutes or so for the system to start downloading to Facebook? but all i know it stll hasnt done it and i dont want to wait all night and these people dont answer their phones at customer service unless you go online and i do have a corel account., and that doesnt matter at all. But i need to know am i not waiting long enough for the my photoshow to start posting to Facebook? Since I don't use facebook all that often, I did try to "Share My PhotoShow" to facebook. It didn't work. It should have given you a message asking for an account. You will have to report it to Roxio/Corel to see if they will do anything about it. I will report it also. In the meantime, you may want to lof into facebook and start a message with the link to the PhotoShow for all your facebook followers. also too i tried to upload my photoshow creation from youTube and it couldnt do it! and i signed up with these people because they advertise that you canupload to youtube also with the premium service! and now in finding that i cant and i almost want my money back! unless these people show me how its done i want my money back immediately! You have 30 days to get your money back. Please don't wait too long if PhotoSHow doesn't do what you want. Rants don't get you very far on these forums. We are users just like you except we have more experience. I raised the issue with Corel tech services via facebook. Did you contact them at all? My one voice is NOT as effective as several people saying the same thing. Did you buy the premium membership? Are you working with the on-line version or the desktop version? Did you read the help files? 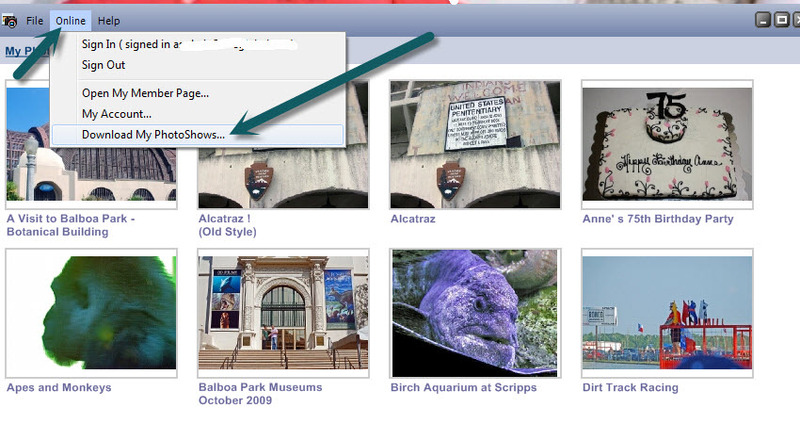 If you are using the on-line version, open the desktop version, log in and download the PhotoShow to your computer. Once that is down, select it and select share. Select to output to video file. Create a wmv file (video file). Once that is done, use the on-line YouTube uploader to upload the PhotoShow to You Tube. That method is faster and more foolproof than any other. Making the PhotoShow on your desktop computer is also easier and more foolproof that the on-line version IF you don't want to use the PhotoShow web site. Note with the wmv file, you can also upload it to your facebook account. I just tried it and it works but the facebook upload is slow. That is a facebook issue; not a Roxio one. I know that english is your native language. Please review what you write before you post it. Long, run on sentences with run together words that basically are rants do not attract people who might want to help. Your posts will be ignored and you will have no alternative other than to contact Corel Tech services. excuse me but i didnt know i was ranting! .Ive been coming here posting complaints because i thought this where youre supposed to post your problems with Roxio, i didnt know that Corel has a customer service department where i could voice whats wrong with their service. Im new to this whole entire thing and where my money is concerned i dont like the idea of having technical problems before ive even learned what could go wrong in the first place. I tried calling them but you dont get a live person, instead you get a answering machine that tells you before they can offer any help you have to have a reference number of some sort before they will answer your question. Now i also wanted to say that i do have a wmv file and i tried to upload it from youtube but for some reason YouTube wasnt able to upload it and im not sure why yet. I also have Windows vista and i can only upload to Facebook form my computer file through Windows movie maker and unless its a movie maker project i cant do it.But last but not least im now having problems with Roxio saving my projects to my computer, it says saving movie ,but when i check my file i find it hasnt been saved at all, only one time ive been sucessful at this.Also there's one thing i have noticed about Roxio , they certainly rather we users come here than bother them with complaints as opposed to buying one of their products, ive learned that all too well already. I haven gone to Facebook to complain to them because again i didnt know i could, but i have a feeling it may not do any good. Go to the share screen in PhotoShow, then you will see the .option to CREATE a video file. Create the wmv file there and upload that. If you have issues related to uploading to YouTube and/or facebook via their uploads, it sort of says that there is something blocking your uploads. I would suspect that the format you are trying to upload is not acceptable to those sites. Deleted e-mail to stop spam. If it works sometimes in PhotoShow and doesn't at others, there are a couple of things to look at. : Go to 'help" and look at the limits. 1) Number and format of image files. 2) Size and format of any added videos. 3) Use of DRM protected audio files from someplace like itunes or just music from iTunes folders. 4) Use of other than mp3 files. I know some other formats are supported but sometimes they don't work. Only standard mp3 files work - there are a lot of different mp3 file types. 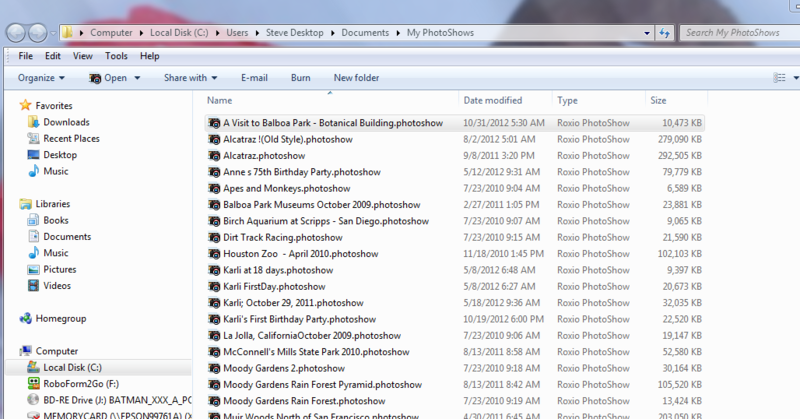 Again, if you save projects from the desktop, you will save in the ".photoshow" format. These cannot be uploaded to anywhere other than to the PhotoShow web site. Select upload in the desktop version and make sure you are signed in. If you complete your project and select share, you can make the video file in wmv or mpg2. Those can be uploaded to site like YouTube or Facebook or probably Smilebox. I have not used or even heard of that one. Use the uploaders from those sites. This has never failed me. okay i will, but i wanted to say that i uploaded my first project form photoshow to my computer and from there i uploaded it to my YouTube page, and it went well, but this time it still isnt working, but i tried saving this latest project as a mp4 video as it says on the share page, and i think they said it takes a couple of days. I did this last thursday and i dont know if this will work because ive never done this before and i really am a newbie at this in every since of the word. Have you done this before? and what is a mp4 video ? and will it be saved in my computer file under photoshow?.Thanks for your help so far,sorry for the misspellings because i cant type very well. in continuation from my previous post here, i forgot to say when i lookked at the page you showed me here, i saw export video file when i first uploaded my project to my computer, and i later got it to Youtube as well, and even then the Facebook option wasnt working. Now also my windows movie maker isnt working either but thats another story...lol and ive contacted them already, and i dont know if you use Windows movie maker or not but its great when it works. Anyway as i was i wasnt having any trouble with Roxio Photoshow after i paid them and my videos went well and i was able to export them to the Windows Media Import File, its just that now that option isnt showing up, and downloading the desktop version again isnt an option, because i dont want to lose the money ive paid already and risk being charged twice. Well anyway sir kindly let me know if you have any more suggestions, Corel has already let me know that they have downloading issues and im not sure they have any ready made solutions just yet. The mp4 file option now works about 10% of the time and it seems that Roxio/Corel can't/won't fix it. 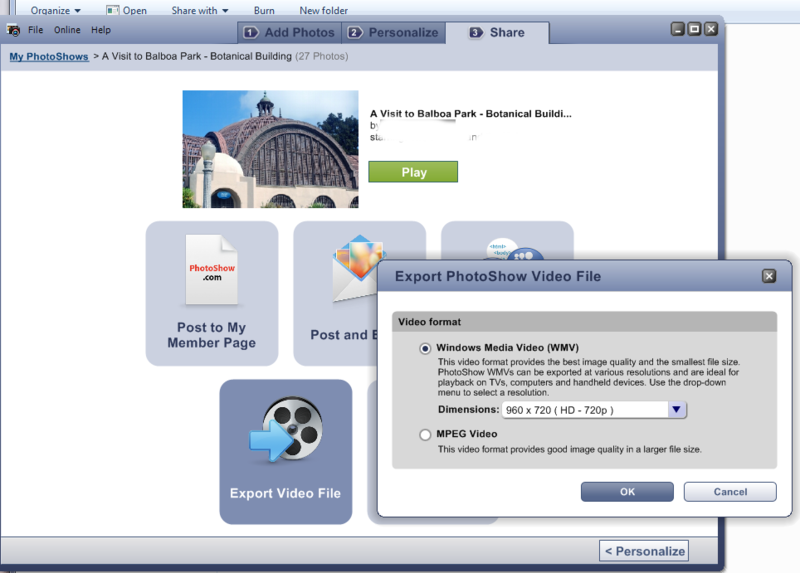 If your PhotoShow is on the PhotoShow web site, you had the option to convert it to an mp4 file. You could then download that file to your computer and then burn it to a disc or other if you had the right software. mp4 is an Apple good definition video format that is compressed. It can be used on many if not all portable players; not just I-Whatevers. You should have gotten an e-mail from PhotoShow to say that your mp4 file was read to download. Check your junk files for that message. It will give you a link to download that mp4 file to where ever you want. (for instance your desktop or your videos) and is convenient for you. If you go to your members page and go to the software download, you can re-download Version 6 as many times as you need to. There is no extra charge. Download it to your desktop and install it. There is no need to uninstall the previous version. Do all your PhotoShows on your desktop or if you really want to do them on the web site, do so. When you gety the email that it is donw, Open the desktop version, sign in and then download the PhotoSHow to your computer via that option in Version 6. Once you have it on your computer, you can select to share it and make it into a wmv or mp2 file. WMV is propably better. WMV = Windows Media Video. Once that completes, you have the file that you can upload. If it doesn't upload, make sure that the length of the video is within the limit set by youTube. It used to be 10 minutes, I think it is now 15 minutes unless you are a frequent user. If so, then you can upload more. How long is your PhotoShow? Just a caution. If you use your own music and it is DRM protected, YouTubes bot may tag it as a protected file. You will get a message to take it down or prove that you have permission to use it. I got that with a 60 year old Jonny Cash piece of music. I have had the exact same problem! I called support and they said they weren't able to help me that I needed to start a chat. So I did that and got absolutely nowhere. So then I sent an email... of course I haven't got a response back. This is probably the worst company I have ever dealt with. I have made a trailer for my book and I need to upload it to Facebook. I can not just post the link because people will not click on it they have to actually see the video and then make the decision whether to hit play or not. I've tried to download it as an mp4 so then I can upload it to YouTube and an error always pops up. I am so beyond frustrated. Download the desktop version 6.1.0 build 2. Open it and sign in to your photo show account. Download the show you want then export it as a mpg file on your PC, then upload it to facebook.